Abstract—The proposed method is based on the Biot theory of wave propagation in porous saturated elastic media. To simplify the cumbersome full calculation procedure, specific features of typical fibrous porous materials are used: a large density and moderate stiffness of the elastic frame in comparison to air. 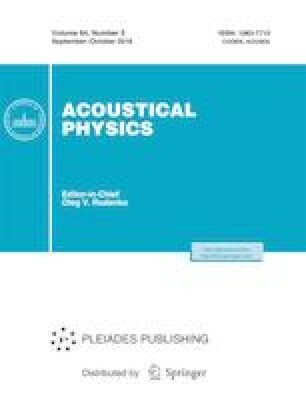 In this case, the transfer properties of an elastic porous layer are represented by two second-order matrices, which characterize sound transfer by airborne and frame-borne waves. Combined with the boundary conditions, such a representation in standard schemes makes it possible to form a single transfer matrix for the layer, by considering it a linear four-pole that relates the pressures and normal velocity components at the inlet and exit. When calculating the sound insulation of a multilayer structure, the formed matrix of the elastic porous layer is introduced via a cofactor into a chain of second-order transfer matrices determined by the other layers. Examples and comparative calculations are presented that demonstrate the high correspondence of the method’s results to the full calculation data.